On February 26,2001, Mullah Umar, the Supreme Leader of the Taliban militia ruling most of Afghanistan, ordered the destruction of all statues in areas under Taliban control. Starting on March 2, the Taliban embarked on an extended campaign using dynamite, anti-aircraft guns, and other heavy weapons to destroy the two best-known pre-Islamic relics in the country, the Buddha statues of Bamiyan. Their construction began in the second century CE under the Buddhist king Kanishka and was probably completed in the fifth century CEo The taller, at 55 meters (175 feet), is believed to have been the largest statue of the Buddha in the world; the smaller statue, at 38 meters (115 feet) tall, also ranked among the largest surviving images of the Buddha. Through a thousand years of Muslim rule they had suffered only sporadic, isolated attempts at their destruction by particularly zealous iconoclasts. More recently, they had be~n viewed as the centerpiece of Afghanistan’s (albeit small) tourist industry and were promoted as a symbol of the country’s long heritage, appearing on postage stamps and state-produced cultural publications before the Soviet invasion of Afghanistan in 1979. The obliteration of the Bamiyan Buddhas was accompanied by the destruction of most, if not all, of the Buddhist figural art left in Taliban-controlled Afghanistan after two decades of looting and bombing in the war against the Soviet Union and the subsequent civil war. The six-week-long saga, beginning on February 12,2001, with the announcement of the planned destruction of the Buddhas and ending shortly after the confirmation of their destruction on March 26, unfolded amid a massive international campaign to save the statues. Their destruction was widely condemned in the Western world, in countries with Buddhist and Hindu populations, as well as in Islamic countries such as Afghanistan’s neighbors Iran and Pakistan. Criticism of the Taliban by all parties, East and West, consisted of their vilification as intransigent philistines who were utterly intolerant of other religions and of the concepts of art, history, and world heritage. This paper will attempt to contextualize the Taliban’s actions by taking a close look at their statements and behavior as the events unfolded in February and March of 2001. It argues that the Taliban’s destruction of the Buddhas was neither part of a preconceived plan based in an uncompromising and anachronistic view of Islam, nor was it a petulant political reaction to their rejection and isolation by the world community. On the contrary, throughout the weeks in question, the Taliban leadership was sensitive to both international and local public opinion; the discursive process surrounding their pronouncements concerning the Buddhas and others’ reactions to them played a large part in shaping the Taliban’s self understanding. Much has been written on Muslim attitudes toward idolatry. Finbarr Barry Flood has written an interesting article historicizing the Taliban’s acts in an Islamic context in an attempt to show that their sort of iconoclasm is an aberration and not part of a universal Muslim attitude toward idols and images.’ Islam shares with Judaism and Christianity a twofaceted distrust of visual and physical representation. On one side is the preference for the nonphysical over the physical, thought over matter, that pervades the philosophy of late antiquity and to which Islamic philosophical thinking is a direct heir. On the other is the scriptural prohibition against figural imagery. It is worth noting, nonetheless, that there is no clear Islamic condemnation paralleling the Biblical ban of the second commandment. Qur’anic condemnations are nowhere as explicit, perhaps the clearest being, “And Abraham said to his father Azar: Do you take idols (asniiman) as Gods? Indeed I see you and your people in a manifest error” (6:74). The ambivalence of Islamic attitudes toward idolatry and iconoclasm is evident in the following accounts of Muslim encounters with idols. Two are from the South Asian context and one from the formative period of Islam. The implications of Ibn al-Kalbi’s account of the killing of al-‘Uzza are clear. Muhammad did not deny that al-‘Uzza was real. She was not a mere tree that the ignorant pagan Arabs insisted on worshipping; Dubayyah, her custodian, did not try to stop Khalid ibn Walid himself but rather he beseeched the goddess to defend herself (and, by extension, those who worshipped her); and it took one of the greatest champions of Islam to kill al-‘Uzza, a feat that presumably could only be accomplished because it was the will of the superior deity of Muhammad and Khalid ibn Walid. Al-Muqqadisi’s description of the Indian temple is similar in its open acknowledgment of the power of the idol. Clearly, neither he nor Ibn al-Kalbi denied the existence of supernatural power resident in idols; they simply saw them as doctrinally illegitimate and inferior both morally and in power to Islam and Allah. In contrast, Babur’s iconoclastic act ostensibly was motivated not by religion as much as aesthetics: the vulgar statues of Urwahi were a stain on an otherwise very pleasant place. These varied examples notwithstanding, Islam has an undeniable iconoclastic ethos similar to that of Judaism and most of Christianity. The Qur’an situates Muslim monotheism squarely within a Biblical prophet tradition in which Abraham is the protomonotheist who rejects the false gods of his ancestors. There are many instances of Muslims destroying Hindu idols for the express purpose of eliminating idolatry or marking the victory of Islam, and some Central and South Asian Muslim rulers proudly bore the title of “idol-destroyer” (but-shikan). The Taliban’s destruction of the Bamiyan Buddhas must be seen within the context of Muslim historical memory in which intolerance of idols can easily, if erroneously, be seen as woven into mores of proper Muslim behavior, and iconoclasm – if not always viewed as laudable- is never a popularly condemnable act. The Taliban’s destruction of the Buddhas in February and March 0f2001 coincided with one of the holiest periods in the lunar Islamic year, called the Hijri calendar, which is used in most Muslim societies including Afghanistan. The Hajj pilgrimage, a central ritual that ends on Eid al-adha, the holiest day of the Muslim year, fell on March 3-6. The timeline leading up to the destruction of the Buddhas is therefore critical to understanding the Taliban’s actions. I have provided the major dates in the Gregorian calendar with the corresponding Hijri date in parentheses. 1996 (1417): Taliban conquered Kabul for the first time, making them de facto rulers of Afghanistan. 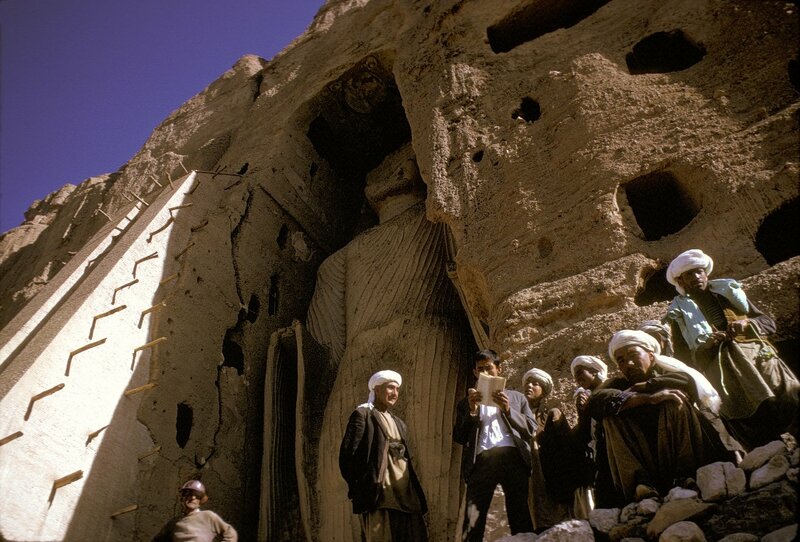 1998 (1419): A preliminary attack was made on the smaller Buddha during the Taliban occupation of Bamiyan. July 1999 (Rabi’ al-awwal142o): Supreme Leader of the Taliban, Mullah Umar, decreed protection for all nonMuslim relics, including the statues. February 12, 2001 (19 Dhu’l-qa’da 1421): The BBC reported that Taliban representatives, invoking the Islamic prohibition against the depiction of living things, had destroyed over a dozen ancient statues in the Kabul National Museum . March 1, 2001 (5 Dhu’l-hajjah 1421): It was widely reported that the Taliban had started using heavy weapons to destroy the statues. March 2, 2001 (6 Dhu’l-hajjah 1421): The Pakistan-based Afghan Islamic Press quoted Taliban sources as saying explosives were being brought to Bamiyan from other provinces and that all statues in Talibancontrolled areas were in the process of being demolished. India offered to take custody of the artifacts.? March 11, 2001 (15 Dhu’l-hajjah 1421): A joint UNESCOOIC (Organization of the Islamic Conference) delegation arrived in Pakistan to plead with the Taliban, led by Qatar’s Minister of State for Foreign Affairs, Zaid al-Mahmud, accompanied by Shaikh Nasr Farid Wassel, Mufti of Al-Azhar (the most prestigious religious institution in the Sunni world), as well as by another Al-Azhar-based scholar, Shaikh Muhammad al-Rawi; they were to be joined by Yusuf al-Qaradawi, the most popular preacher in the entire Arab world. March 20, 2001 (24 Dhu’l-hajjah 1421): The U.S. government rejected Taliban claims that the statues’ destruction was justified by an alleged UNESCO offer of money to save the statues when no money was offered for the starving people of Afghanistan. It also insisted that sanctions against Afghanistan would stand until bin Laden was handed over. March 22, 2001 (26 Dhu’l-hajjah 1421): journalists were taken on a tour of Afghanistan’s national museum to see the results of the destruction there. March 26, 2001 (1 Muharram 1422, New Year’s Day in the Hijri calendar): Twenty journalists were flown to Bamiyan to see the destroyed statues. November 11,2001 (24 Sha’ban 1422): The Taliban destroyed the Bamiyan town they retreated in front of the advancing local militia, Hizb-e islami. The calendar was a central factor not just in evoking religious memory as the Taliban cast themselves as moral heirs to Abraham but also in the very progression of events. Demolition work was suspended for Eid al-adha, and there appears to have been a brief lull during which Mullah Umar was directly responsive to opinion from the Western and Islamic worlds. However, the high-level delegation of Muslim clerics was prevented from being assembled until March 11 (15 Dhu’lhajja) by the same holiday. The Taliban’s responses to statements and proposals from the West, which seemed oblivious to the symbolism of what the Taliban saw themselves as doing, were clearly colored by the calendar. Significant among these was the offer of New York City’s Metropolitan Museum of Art, made through the United Nations, to pay for the removal of all moveable relics in Afghanistan. This offer came during the Hajj, at a time when the memory of Abraham could not be stronger, since both the Hajj and Eid al-adha commemorate events in Abraham’s life, in particular his opposition to idols and his willingness to sacrifice his son for the sake of God. It is no wonder that such offers were widely reported in newspapers read by those sympathetic to the Taliban. It is in the context of local opinion and media that the Taliban’s actions come into clearest light. Given the almost complete absence of publishing in the Taliban’s Afghanistan, their international isolation, strong ideological ties with religious groups in Pakistan, and the pattern of reliance on Pakistani resources forced. on many Afghans through two decades of war, the local press to which the Taliban reacted most directly was that of Pakistan. The emotional links between the Taliban and some religious elements in Pakistani society are very deep.’7 Most of the Taliban leadership was trained in Pakistani seminaries belonging to the Deobandi school of Sunni thought, a somewhat puritanical reform movement started in opposition to British colonial rule in India. Deobandi ideology, which teaches that a Muslim’s primary loyalty is to the religion, not the nation-state, and actively encourages individuals to agitate forthe political unification of the world’s Muslim population, has a substantial and influential following in Pakistan. The majority of religious seminaries are run by Deobandis, and the political party associated with the school, the Jamt’at-e ‘ulamii-ye Islam (henceforth jUI), has a disproportionate degree of influence in Pakistani politics. In many ways, the Taliban can be seen as the wayward children of the jUI, born in politicized seminaries and traumatized by the Afghan civil war. Large numbers of Pakistanis joined the Taliban and fought in Afghanistan in the late 1990s, and many more viewed the Taliban as ideologically admirable harbingers of a Muslim utopia. The Taliban, in turn, depended on Pakistan for education and military training, as well as economic and moral support. Though not always tractable in their decision making, there is no doubt that they were ever cognizant of the importance of Pakistani public opinion and shaped their policies to reflect that. Very insightful work has been done concerning the difference between English and local-language media in India. In Politics after Television, Rajagopal demonstrates how the English-language media failed to see the growth of Hindu nationalism through the late 1980s and the 1990S. When the serialized Ramayana began in 1985, many found it significant only because it was the most-watched show in the country. The English-speaking self-proclaimed shapers and arbiters of public opinion were taken completely by surprise when this TV show became the fuel for the Ram janam Bhoomi movement, which culminated in the destructiDn of the Babri Mosque on December 6, 1992.’8 The destruction of th is mosque was widely condemned by the Pakistani public and its memory played a significant role in the Taliban’s rhetoric. In Pakistan, the relationship of language to newspapers is somewhat different, in the sense that Urdu, Pakistan’s national language, is pervasively used. Not only can Urdu language publications be considered mainstream, but Urdu newspapers of record also follow the same journalistic standards as English-language papers, unlike the other non-English press in India. n’s population, published a much wider spectrum of opinion. The daily Jang, which is published by Pakistan’s largest media group and employs a neutral reporting mode, provided extensive coverage ofTaliban statements as well as reactions by Muslim clerics, some of whom supported the Taliban. It also displayed a much wider range of opinion in editorials and letters to the editor. The majority of letters to the editor in Jang brought up Western hypocrisy. Some specifically mentioned iconoclasm as a religious duty; complained of the lack of international concern when the Babri Mosque was destroyed a decade earlier, of an anti-Muslim bias in the West; and connected the sanctions on the drought-stricken people of Afghanistan to the persecution of Muslims in Bosnia, Chechnya, Kashmir, and the Palestinian Territories. ashmir, and the Palestinian Territories. The Taliban’s public statements should be seen in the context of Pakistan’s Urdu press, where they seem the least irrational. Trying to justify the destruction of the statues, the Taliban and their sympathizers stressed four main points. In addition to the commonly made claim of the hypocrisy in concern over dead stone but not for living human beings, the Taliban and supporters argued that the statues were not objects of worship since there were no Buddhists in Afghanistan. As such, destroying them was not an act of desecration or persecution. Thus they pointed out that their actions were not out of line with Islamic injunctions to respect other religions, an accusation leveled against them from a number of quarters. Since no one worshipped the Buddhas, they were not covered by rules of protection that were extended to idols in Hindu temples and homes in Afghanistan. (In fact, the Taliban reacted very strongly to accusations that the destruction of the Buddhas was sym ptomatic of their treatment of religious minorities.) In direct contradiction to these points were statements made by Taliban spokesmen as well as sympathetic Pakistani clerics saying that the Taliban’s acts were payback for the destruction of the Babri Mosque at the hands of Hindu militants.2o Finally, the religious argument was linked to the accusation of hypocrisy on the part of the international community: the very fact that money was offered to save the statues transformed them from artifacts into idols since they were now being venerated more than human lives, and this reverence necessitated their destruction. The destruction of the Buddhas illustrates the vast gap that exists in the values and priorities of different populations within South Asian societies. Those who condemned the destruction of statues on the grounds of preservation of global heritage, art, and religious tolerance, view the icon smashers as the standard-bearers of an archaic ideology completely out of place in modern society. The defenders of the act of destruction see the condemners as dupes and apologists of the West, deracinated and desacralized. The important question is whether it would have been possible to save the Buddha statues.It is conceivable that, had international sanctions on Afghanistan been lifted and combined with non-sensationalistic diplomatic efforts, the Taliban might have been convinced to let another country take custody of the statues. But in light of the Taliban’s human-rights record and their stance on the extradition of bin Laden, there was little chance of a more conciliatory international position. The events of February and March 2001 confirmed the Taliban’s status in the eyes of their supporters as pious champions of Islam against its international foes, just as it reaffirmed the view of the international community (and this includes the majority of Muslims) that the Taliban were intolerant, uneducated, and irrational. The current government of Afghanistan has declared rebuilding the Bamiyan Buddhas a cultural imperative, although it remains unclear when and how this will be carried out. One of the more ambitious schemes approved by the government is a proposal by the japanese artist Hiro Yamagata to mount a sound-and-laser show that would project Buddha images at Bamiyan, powered by hundreds of windmills that would also supply electricity to surrounding residents. The cost is estimated at $64 million.28 Many people have questioned the ethics of spending large sums to make replica statues in a country where the overwhelming majority of the population lives without personal security or the basic necessities of life. The moral balance of human lives against inanimate artifacts faced with destruction is difficult to weigh-and the dilemma is no easier when considering their reconstruction. Jamal J. Elias is professor of religious studies at the University of Pennsylvania, where he holds the Class of 1965 Term Professorship in the School of Arts and Sciences. He is the author of a number of books and articles on a wide range of subjects dealing with Islamic cultural and intellectual history. An earlier version of this essay was presented at the conference Deus (e)X Historia: Exploring Divinity and Reason in the Production of Knowledge, held at the Massachusetts Institute of Technology in April 2007. ‘Fin barr Barry Flood, “Between Cult and Culture: Bamiyan, Islamic Iconoclasm, and the Museum,” The Art Bulletin 84, no. 4 (December 2002): 641-59. Flood’s essay also contains a very thoughtful discussion of questions of museumship and preservation as they pertain to the international attempt to preserve the Buddhas of Bamiyan. “Taliban Assembling Explosives to Blow up Buddha Statues,” Pakistan Times, March 3, 2001. “Taliban Assure Protection to Historic Relics,” Pakistan Times, March 20, 2001. “Molly Moore, “Afghanistan’s Antiquities under Assault,” Washington Post Foreign Service, Friday, March 2, 2001. Jean-Michel Frodon, “The War of Images, or the Bamiyan Paradox,” in iconoclash: Beyond the Image Wars in Science, Religion, and Art, ed. B. Latour and P. Weibel, 221-23 (Karlsruhe and Cambridge, Mass. : ZKM and MIT Press, 2002), 222. Jean-Fran~ois Clement, “The Empty Niche of the Bamiyan Buddha,” in iconoclash: Beyond the Image Wars in Science, Religion, and Art, ed. B. Latour and P. Weibel, 218-20 (Karlsruhe and Cambridge, Mass. : ZKM and MIT Press, 2002),218. 6 The question of why the Taliban did not destroy the Buddhas earlier in their rule of Bamiyan remains unanswered. Their anger at having been internationally ostracized no doubt played a role. It is also likely that different factions within the Taliban disagreed on how artifacts from Afghanistan’s pre-Islamic past should be treated, with Mullah Umar representing the tolerant end of the spectrum (evidenced by his declaration of protection in 1999) and hard-liners, such as Mullah Dadullah (killed in May 2007), insisting on their destruction from the beginning and eventually leaving Umar with no choice in the matter. 7 For an introduction to the Taliban and their relationship with the Pakistani government and society, see Ahmed Rashid, Taliban: Militant Islam, Oil, and Fundamentalism in Central Asia (New Haven, Conn.: Yale University Press, 2001). ,8 A. Rajagopal, Politics after Television: Hindu Nationalism and the Reshaping of the Public in India (Cambridge: Cambridge University Press, 2001). See also V. Naregal, Language Politics, Elites, and the Public Sphere (New Delhi: Permanent Black, 2001) and R. Jeffrey, India’s Newspaper Revolution: Capitalism, Politics, and the Indian-Language Press, 1977-99 (New York: St. Martin’s Press, 2000). The Babri Mosque, named after the aforementioned emperor Babur, commemorates the establishment of Mughal rule and is viewed with reverence by many South Asian Muslims. 9 The letters were: Barkatullah Marwat (Kuwait), March 15, 2001; A. Khan (Islam· abad) March 28, 2001; Rohul Amin (Swat), March 30, 2001.
tions on the Taliban on July 5,1999, in an attempt to force them to stop providing sanctuary to Osama bin Laden. On October 15 of the same year the UN Security Council unanimously adopted Resolution 1267, which imposed financial sanctions and a flight-ban on Taliban-controlled Afghanistan if it failed to turn bin Laden overto a competent authority within thirty days. These sanctions were strengthened in December 2000, despite an August 2000 report from the UN Office for the Coordination of Humanitarian Affairs (OCHA) that the sanctions were having “tangible negative effect” on the population of Afghanistan (“Sanctions against Al Qaeda and the Taliban,” Global Policy Forum: http: http://www.globalpolicy.org/security/sanction/indexafg.htm .). Note: A pdf of this article, inclusive of pictures and captions that we have not been able to reproduce in this format, can be found here. 0 “Ye Babri Masjid ki shahadat ka radd-e ‘amal he, Taliban” (This Is the Consequence of the Martyrdom of the Babri Mosque), lang, March 5, 2001. “This statement has gained much popularity among Muslim admirers of Mahmud of Ghazna, although it does not accurately reflect his words as they appear in the historical work from which they are drawn. The chronicle Tiirikh-ifirishta describes Mahmud as being concerned with the judgment of posterity and declaring his preference for being remembered as a destroyer of idols. See Muhammad Qasim Firishta, Tiirikh-e firishta, 2 vols. (Lucknow, India: n.p., 1905), 1:33; English translation by John Briggs, History of the Rise of the Mohammedan Power in India, 4 vols. (1829; rpt. Delhi: Low Price Publications, 1990), 1:43-44). 2 “Mullah ‘Umar ne but-shikani ka hukm de kar sunnat-e Ibrahimi ko zinda kiya” (Mullah Umar’s Brings the Tradition of Abraham Back to Life by Ordering the Destruction of Idols), lang, March 2, 2001. “Taliban ne but6n ko tor kar Nabi-ye Akram ki sun nat ada ki” (Taliban Fulfill the Tradition of the Noblest Prophet by Destroying Statues), lang, March 11, 2001. 5 “Afghanistan men but torne ka iqdam durust he” (Decision to Destroy Idols in Afghanistan Is Correct), lang, March 6, 2001. Hasan Nisar, “But·shikani ka shawq” (Fondness for Iconociasm), lang, March 6, 2001. Carlotta Gall, “Afghans Consider Rebuilding Bamiyan Buddhas,” International Herald Tribune, December 5,2006: http://www.iht.com/articies/2006/12/05/ news/buddhas.php?page=l. For more on reconstruction plans, see “The Bamiyan Project”: http://www.photogrammetry.ethz.ch/research/bamiyan/buddha/ index.html. I wikll bookmark your site and keep checking for new details about once a week. I subscribed to your Feed aas well.